I love winter. The season creates space for quiet and contemplation. And while many see January and February as the cold season's doldrums after the vibrant festivities of December, I find the calm, clean energy of the first two months of the new year to be refreshing. I liken these months as the moments right before something exciting is about to happen. The pause of your pen before committing words to paper. The intake of breath before a kiss. The soft awareness before drifting off to sleep. That liminal space has always been a fruitful territory for me because it is so full of possibility. There is no day better suited to this pregnant fluid space than Imbolc. Traditionally, this holiday, celebrated every February 2nd, represents the halfway point between winter and spring. It is meant to celebrate the coming abundance of the new season, often represented by Brigid, goddess of the dawn and fertility. 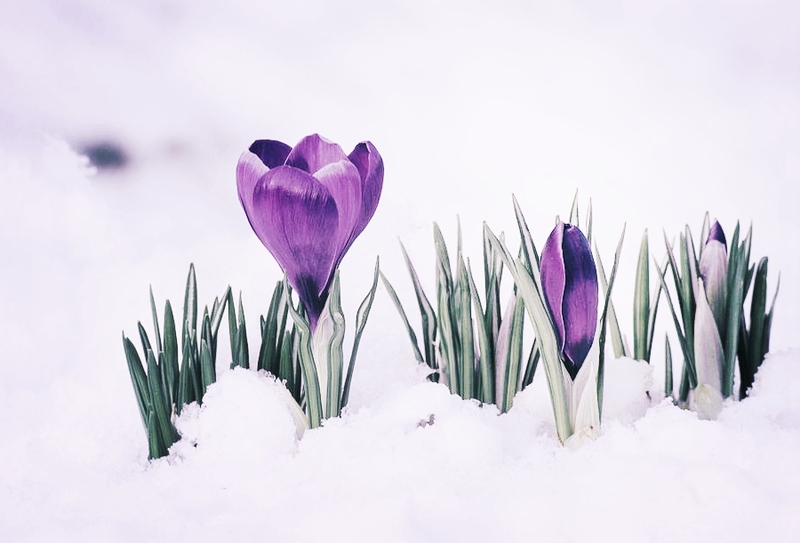 Pausing to acknowledge Imbolc allows you to gather the soul seeds--intentions, hopes, dreams--you hope to plant in the spring and compost things from the previous year that no longer serve you. Below, I've listed five ways to celebrate this dawn-like holiday and honor the power of liminal spaces. 1. Spring clean--inside and out. So I know I write a lot about cleaning the home on the equinoxes and solstices, but you should never underestimate the power of a good scrub-down. It sweeps away stagnant and negative energies that might have built up over the season and allows you to take a good hard look at what you allow into your sanctuary. Lately, I've been getting rid of the clutter in my home and making sure everything I have is used or has a purpose (including enjoyment). If it doesn't, it gets donated. Through this, I've also decluttered my mind, saying goodbye to old, unfruitful conceptions of myself in the same way I got rid of wasteful one-use plastics from my kitchen. Take this time to consider what brings you joy and what doesn't. Then cleanse accordingly. 2. Collect seeds. This could be a literal gathering of daffodil bulbs and hollyhock disks for your garden, along with the harvested seeds of last year's lettuces, radishes, and tomatoes. It could also be your soul seeds. What do you want to manifest? What do you want to make fertile and plant come spring? you'll notice here that I said "collect" and not "plant" them. There is much magic, much medicine in allowing things to incubate before you take action. Imbolc is the embodiment of that pregnant pause before birthing your new dreams. So take a pause. Hold your seeds close. Let them speak to you. They will tell you when they are ready to be planted. 3. Take a radical self-care day. Okay, so realistically we can't necessarily take off work for Imbolc, but it's a good idea to schedule in some TLC on the 2nd. Just as seed-gathering is important to mark the coming spring, so too is relaxation and hibernation essential to honor the passing winter. Pause. Recharge. Nourish your soul and reconnect to yourself. 4. Feed your garden. When we think of gardening, we think of planting seeds in the spring, tending it in the summer, and enjoying the fruits of our labor in the fall. It is equally important, however, to tend our garden during its dormant season: cleaning up the debris that settled over it during the winter, pruning and tending the hearty cold weather plants, and turning your compost. Get dirt in your fingernails and dried leaves in your hair. Breath in the scent of rosemary and freshly turned earth. Your garden--and soul--will thank you. 5. Cook a seasonal feast. It would be remiss of me to not to mention feasting for any nature-based celebration. They are all, in one way or another, about honoring the abundance in our lives! For Imbolc, in particular, it's a good idea to make a feast using dark greens and other produce that is in season now. I'm a fan of making dishes that use burdock root or dandelion leaves for their powerful detoxifying properties. This is a season of energetic cleansing, after all. How do you celebrate Imbolc?